The objective of this lab is to become familiar with the high frequency spectrum analyzer by viewing the frequency spectra of frequency modulated and amplitude modulated waveforms. 3)	Press the step size button. 4)	Press the up button until the step is 1,000,000Hz. 5)	Press the Center Frequency button. 6)	Press the down button fifteen times. 7)	Press the Span button. 9)	Adjust the frequency dial until the HP3312A until a spike appears in the center of the screen. 11)	Move the frequency dial until the marker is at the peak and record the frequency and dBm value. 12)	Set the HP 3312A to external AM modulation with an amplitude of 1 Vpp. 13)	Press Single Sweep on the analyzer and record the result. 14)	Use the marker to record the dBm values and frequencies of the peaks. 16)	Record the voltages and frequencies using the marker. 17)	Switch to continuous sweep. 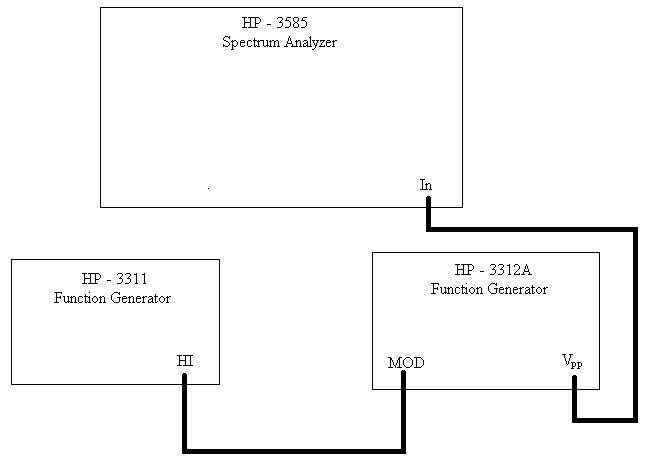 18)	Set the HP3312A to external FM with an amplitude of .01Vpp. 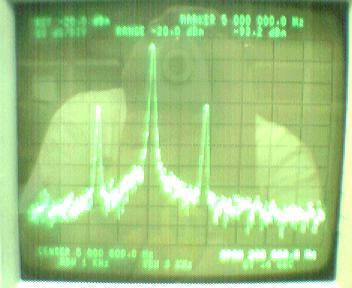 19)	Set the analyzer to a span of 500KHz and record result. 20)	Record the frequency of the peak and their respective voltage and dBm values. 1)	Q:	What was the percent modulation of the AM wave? 2)	Q:	What was the original unmodulated carrier amplitude of the FM signal? 3)	Q:	What are the Bessel Functions of the FM wave? 4)	Q:	What is the modulation index of the FM wave? 5)	Q:	What was the frequency difference of the FM sidebands? 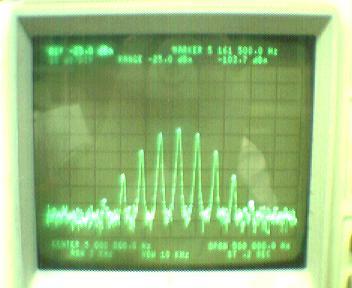 From this lab it, the basics of the spectrum analyzer is described. Also, the frequency spectra of both Frequency Modulation and Amplitude Modulation waves is described. For calculating the modulation index, the J values for the first half of the sidebands are high. I do not know what contributed to this error, but otherwise I feel that the lab is fairly accurate. A decent understanding of the spectrum analyzer has been obtained.